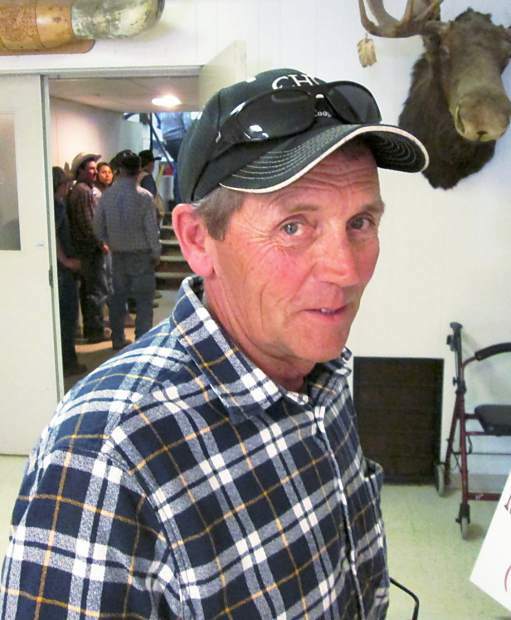 Tim Bernstein, Faith, South Dakota, bought two of the top bulls in Lots 1 and 25. 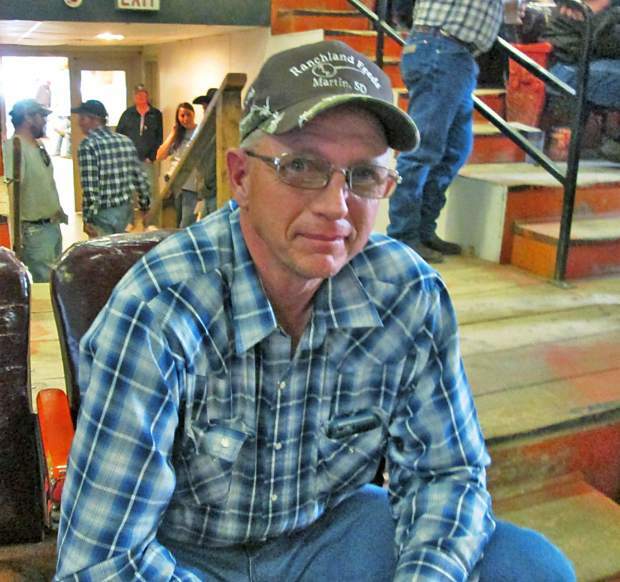 Steve Knutson, Philip, South Dakota, has been buying Stomprud bulls for a number of years. Stomprud Angus Ranch, owned by Larry and Eileen Stomprud, Mud Butte, South Dakota, hosted a good crowd of neighbors and friends, with many repeat buyers on the seats for their 12th sale. This sale offered both yearling and 2-year-old Angus bulls. I certainly felt that this was Larry's best set of bulls. Stompruds develop these bulls on the J & R feed program, and the bulls really expressed themselves. Larry does a lot of AI, and uses sires with balanced EPDs with above average carcass traits, excellent growth, and good maternal qualities. These bulls do well on the "hard grass" prairies of western South Dakota. 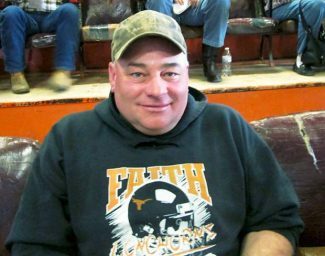 Larry raises cows that can calve on their own out on the range, and these traits are passed onto their progeny. Their cows can mother up a calf and milk well to produce strong, healthy calves. This was an active sale, especially among the buyers that have had these bulls before. Many reputation commercial outfits were competing for the top end of these bulls. The top selling bull of the day was Lot 1, selling for $5,750 to Tim Bernstein of Faith, South Dakota. He was Stomprud Daybreak 51, a son of Mogck Daybreak 1990, and out of a daughter of Stomprud Aberdeen 15. His EPDs were CED 9, BW 0.1, WW 58, YW 107, MILK 27, MARB 0.39, REA 0.76, $W 64.74, and $B 121.71. Born at 77 pounds, this long, deep bull weaned at 799 pounds and grew to a yearling weight of 1,321 pounds. Repeat buyer Norman Delbridge from Faith, South Dakota, chose Lot 4 at $4,750. This son of Mogck Daybreak was out of a daughter of Hoover Dam. He was a true calving ease bull with a 69 pound birth weight and a weaning weight of 731 pounds. His EPDs were CED 15, BW -1.8, WW 54, YW 104, MILK 23, MARB 0.49, RE 0.80, $W 59.41, and $B 119.45. He had an IMF of 4.49 percent to ratio 124, and scanned a 13.9 square inch rib eye. Tim Bernstein also selected Lot 25, Stomprud Safeguard 521, at $4,250. Here was a son of PA Safeguard 021 who was out of a daughter of Stomprud 208 New Design 623. He entered the world at 87 pounds, weaned at 746 pounds, and posted a yearling weight of 1,301 pounds. His scrotal measurement was 38.51 cm, and he scanned a 14.5 square inch rib eye. His EPDs were BW 0.7, WW 51, YW 93, MILK 29, MARB 0.64, REA 0.27, $W 58.54, and $B 88.94. Ed Briggs from Midland, South Dakota, bought Lot 6 at $3,750. He was sired by Mogck Daybreak, and out of a daughter of SydGen Mandate 6079. With an 87 pound birth weight, he weaned at 778 pounds and grew to 1,295 pounds as a yearling. His IMF ratio was 115, and he had a rib eye of 13.7 square inches. His EPDs were BW 1.0, WW 61, YW 111, MILK 21, MARB 0.67, REA 0.61,$W 59.08, and$B 138.19.